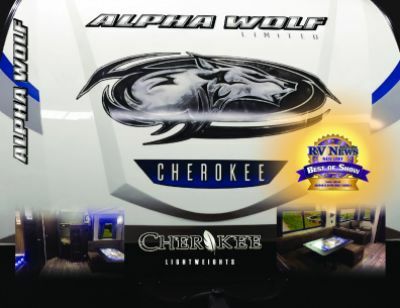 Your family will love this 2019 Forest River Alpha Wolf 29QB-L Travel Trailer, and you'll make vacation memories you'll cherish forever. Here at TerryTown RV, we want our customers to enjoy the best RV experience possible. That's why we offer super low prices and carry a huge inventory of travel trailers, 5th wheels, toy haulers, and more! As a top RV dealer in Michigan, we're ready to put you in your dream Travel Trailer at a price you can afford! So stop in and see us today. We're conveniently located at 7145 Division Ave S Grand Rapids Michigan 49548. Not near your neighborhood? No problem. We have highly satisfied customers throughout the country, thanks to our fast, reliable nationwide shipping! Give us a call at 616-455-5590 and we'll make your dream of owning your very own RV come true! You'll enjoy your family RV vacation anytime you want with the Forest River Alpha Wolf 29QB-L because it's so easy to hitch up and tow. Easy to maneuver too, with a hitch weight of 920 lbs. and a GVWR of 7920 lbs. The 1 slides are flush mounted to reduce wind resistance, and it's easy to set up when you reach your destination. Plus, you'll enjoy shade and comfort outdoors under the 20' 0" patio awning. 10 people can sleep in peace and comfort inside this snug RV! It has an array of sleeping accommodations, but among the coziest is the Queen bed in the master bedroom! You'll start your day refreshed, thanks to the great master bathroom! Shower, shave, or wash up in leisure. You'll have plenty of hot water thanks to the 49 gallon fresh water tank and the LP tank capacity of 40 lbs. This RV comes with a 84 gallon gray water tank and a 42 gallon black water tank. And you won't have to trek to the communal campground bathroom with the handy and sanitary Foot Flush toilet! 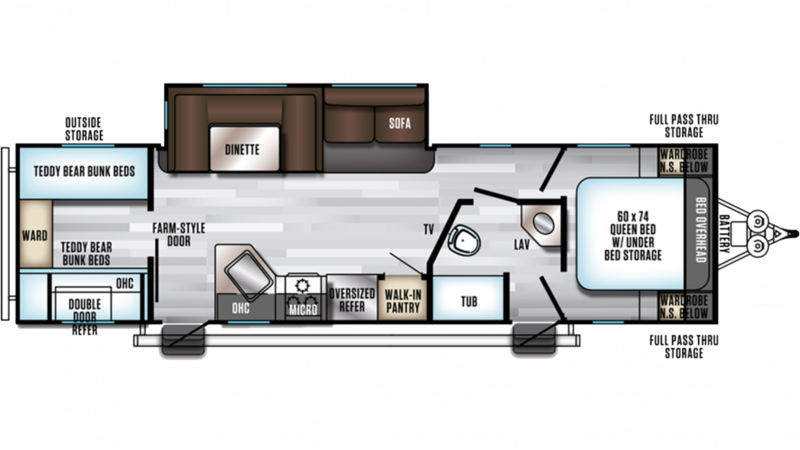 This roomy 2019 Forest River Alpha Wolf comes with plenty of comfortable sleeping space for the family or for your guests. The built-in bunkhouse sports Quad Bunkbeds that offer cozy comfort after a full day's fun outdoors!